Okay, so last we left off, the playroom was under construction, but we could see the light! Literally, because we added a cased opening where there was once a solid wall 🙂 So today, we’re chatting all of the playroom progress we made before moving! 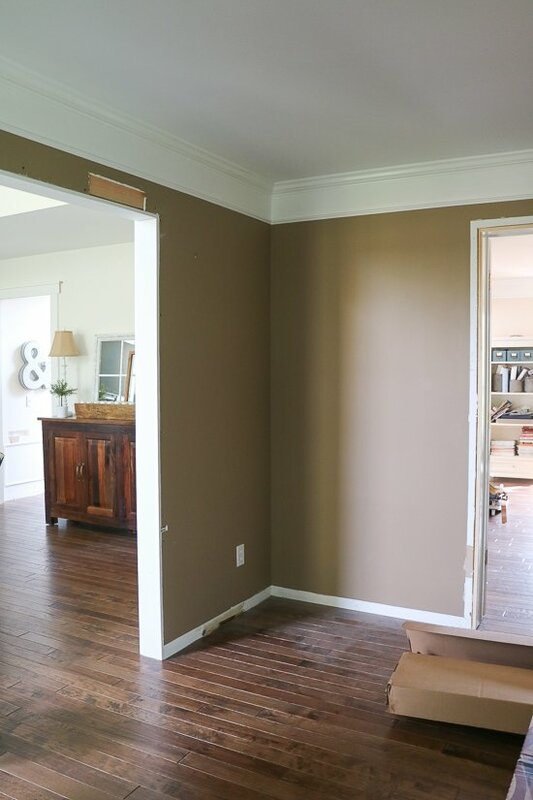 This sadly is a room that I had huge hopes for, but we never got around to finishing it, because we wanted it to leave it as a blank slate, with a nod to a playroom, for potential buyers. 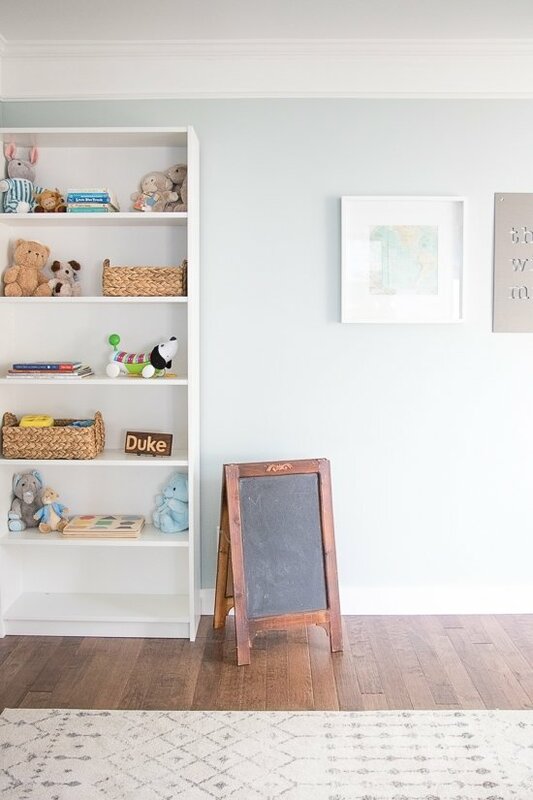 With the opening and new layout, it could be anything from a playroom, to a den, to a dining space, to a library, and the list goes on! Next up was painting. 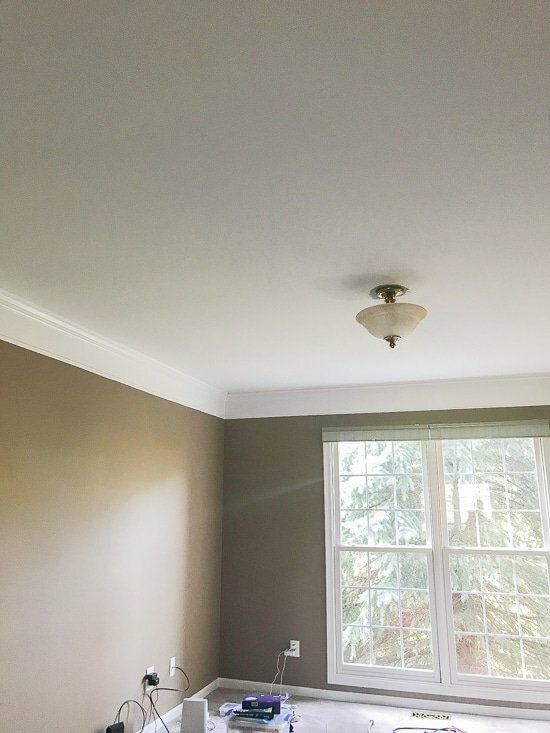 Just changing the ceiling from hunter green to a crisp white made a huge impact, which made me even more excited to get a brighter color on those walls. As you can see out of that window, the entire view was blocked by a massive evergreen. We had plans to eventually remove it (a lot of the neighbors had the same tree and it had fallen in past storms, and we’d rather take it down before it did that, but then we moved and never got around to it!). 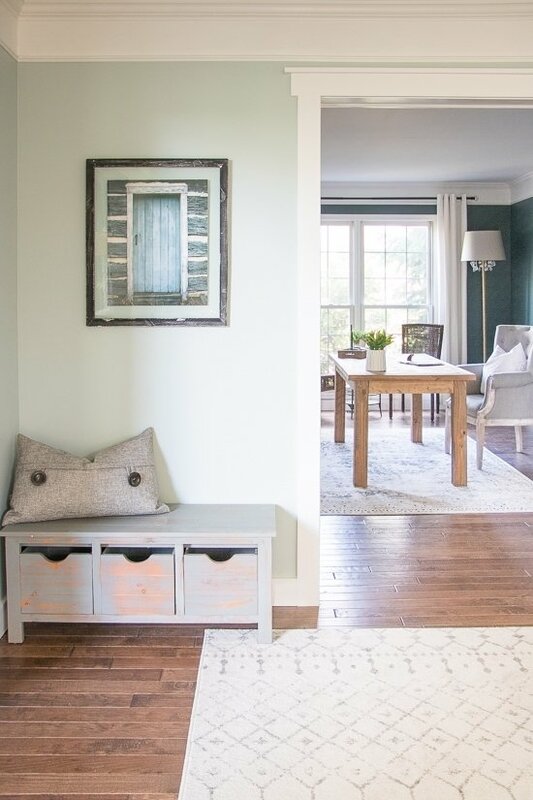 So in order to brighten up the space, we chose a fun energetic color to brighten it all up. 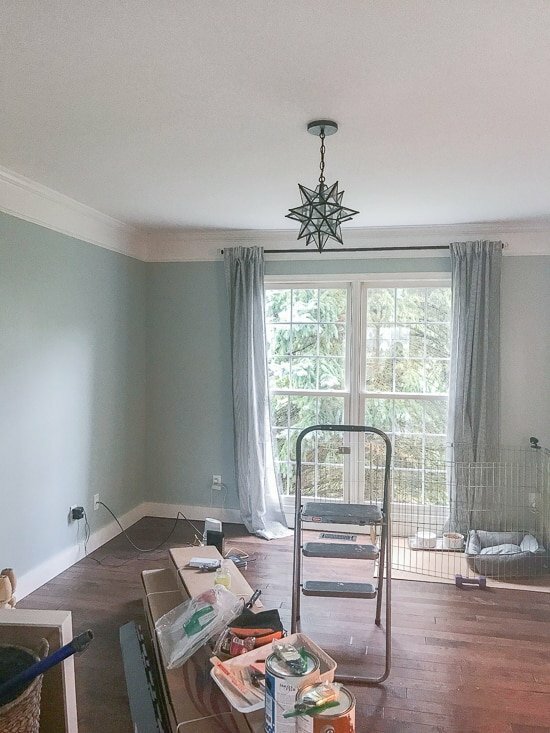 We also swapped out that old dated light to a fun star option from Pottery Barn, and updated all of the trim work to match the rest of the house. After all that, here’s where the room ended up! We’ve already chatted about how these final photos aren’t how I saw the room coming together, so let’s dream a little bit together shall we? 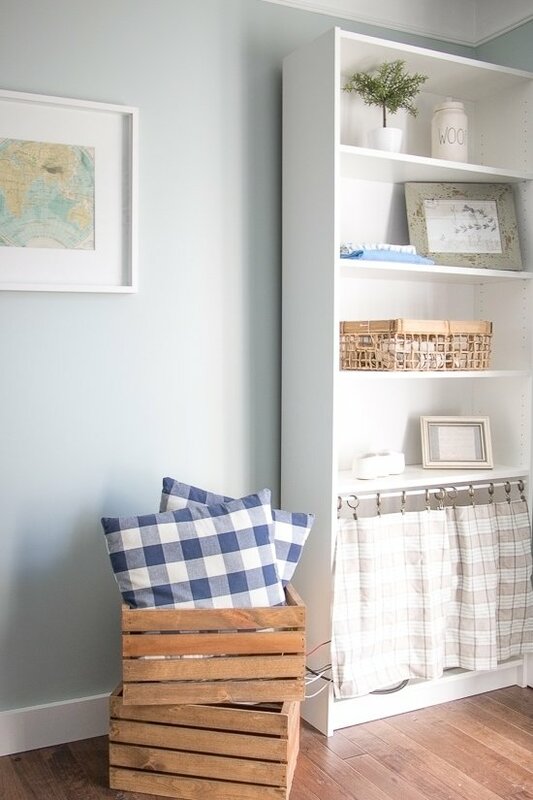 Those bookcases would be built in with a fun pop of pattern on the back, and would extend up to the ceiling. In between them would be this lovely small couch that folded out into a cushion bed for lounging and playing. The TV in the corner (not shown, but I’ll vouch for it’s existence) would be built in to a fun art display, and below it a fun metal wall rack for books. Where the bench is would be a chalkboard wall in a cute shape, and a place to hang masterpieces. The middle of the room would have a cute small table (we have the turned legs from Harp & Co, just haven’t decided on a table top yet!) with some colorful chairs. There would also be barn doors on the living room side of that new opening so we could close off the space if needed. And that wraps up another room at our last home! Only our quick guest room refresh is left, and then we can officially hand over the make-believe keys.